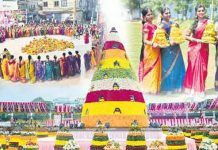 The Government of Telangana recently declared that the official celebrations of Bathukamma will be held from October 9 to 17. 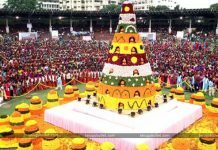 The Government recently proclaimed that nine-day floral celebration will be held officially and the main program of Saddula Bathukamma will be seen on October 17. Recently Nizamabad MP K. Kavitha and Brahma Kumaris Hyderabad Director Rajyogini B.K. Kuldeep formally launched the posters and brochures of the occasion. They said that the festivals would values and spiritual importance of the daily life of people. She also revealed that people from 15 states will perform their respective arts which is organized by Brahma Kumari’s from September 26th to 30th as part of Brathukamma celebrations. In the Mean While, Telangana chief minister daughter MP Kalvakunta Kavitha Formally Wrote a letter to Raja Ananadan(Managing Director of Google India), She Requested him to feature Bathukamma as “Google Doodle” to let the world know the prominence of the great cultural relevance of the state. It’s a women-led festival which celebrates the spirit of women, she included. Kavitha Also mentioned the dates of festivals in a written letter. I Would Be Most Pleased and Thankful if you could kindly give it an expression through google – doodle, she concluded. 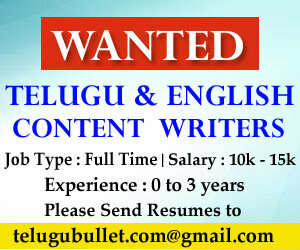 Next articleED raids on Revanth: Is this a secret nexus b/w BJP-TRS?